For those that have seen and enjoyed Disney Pixar's Cars 2, the chance to own this Finn McMissile interactive toy car will be a dream come true. One minute he's in normal car mode then in an instant he's ready for attack. Panels covering his weapons and targeting visor pop open when need to help this secret spy. 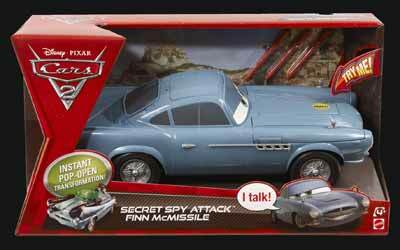 This Finn McMissle car even talks, saying several of his favourite phrases from the film. This car is quite robust and fairly large (measuring 12" in length and 5" in width). You can either play with the car in normal mode, where it looks like a normal toy car, or in battle action mode. 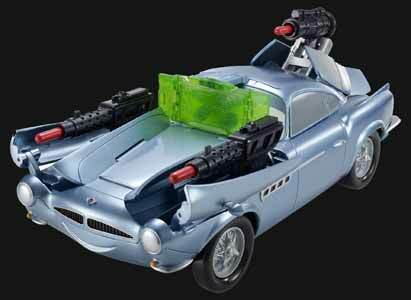 Simply press the bonnet down and two front missile launchers pop-up. Press the back bumper down and the rear rocket launcher appears. To fire the missiles simply squeeze the side of the missile launchers. And to put the car back into normal mode it's simply a question of pushing down the launchers so that they disappear back into the cars hidden compartments. You also have to fold back the missile targeting screen (which is a section of green plastic that pops in front of Finn's windscreen - where his eyes are). Sir Michael Caine, who provides the voice for Finn in the movie, also provides the voice here. Simply press down the bonnet and you'll hear a random phrase from the film; or a car sound effect (be it engine or weapon noise). There are quite a few different sounds and they are played in a random order. 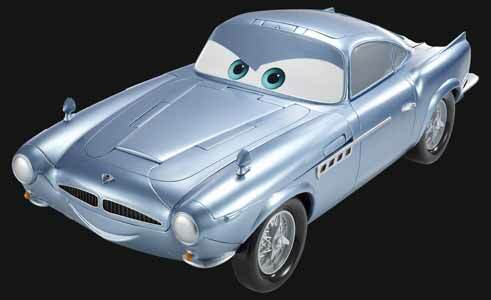 Young fans of the movie will love this well constructed, tough car. And they're sure to spend hours reconstructing scenes from the film.